A simple and fresh recipe to resume the threads of this blog, far too long abandoned due to job, commitments, and other amenities, but always in my mind! 1- Wash the lettuce, cut into small pieces and dry (or simply open a bag of already cut and washed salad! It’s up to you!;)). Do the same with the carrots and cut into thin slices. 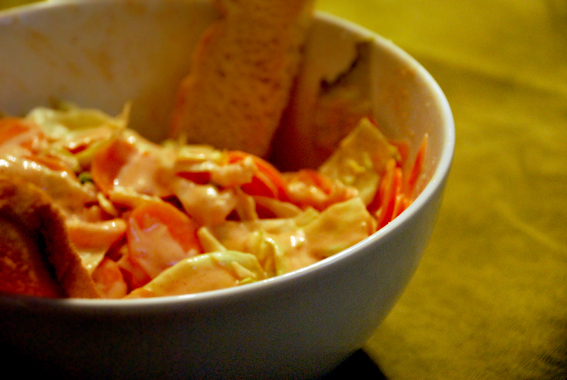 2- Put the mayonnaise, ketchup, paprika, white pepper and brandy in a bowl and mix with a spoon. Let rest in the fridge for about 10 minutes. 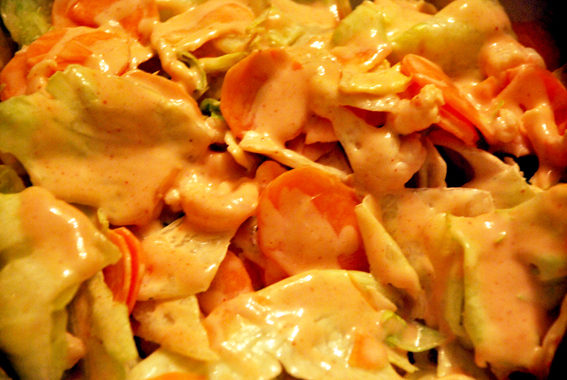 3- Add the shrimps to the lettuce and carrots. Add the cocktail sauce, mix well and add salt to taste. Last thing, add the previously toasted bread cut in 2 pieces to decorate. For a more elegant appearance, put aside some shrimp and use it to decorate the salad. Ah, sun-dried tomatoes! I’m totally addicted to them. My kitchen cupboard could be empty but you’ll always find at least one sun-dried tomatoes jar. They are so delicious even plain on a slice of bread or on a cracker. Well, if you have never tried them, it’s time to start now. Maybe in this recipe! It’s time to a nice, delicious but not so dietetic salad! 1- Wash well the lattuce and the tomatoes. Cut crosswise the leaves in smaller pieces (not too small, you don’t have to mince them!) and slice the tomatoes. Drain the vegetables and put them in 2 single serving-size bowl. Mix the tomatoes and the lattuce. 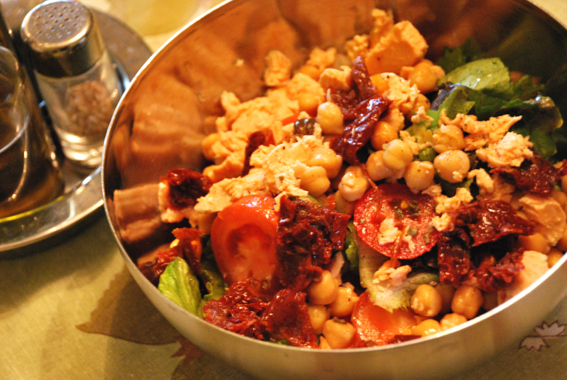 2 – Drain and rinse the chickpeas, divide in two parts and put them on the top of the 2 salad ‘s bowl. 3- Drain the canned or boiled salmon, dice it a little and divide in two parts. Then add to the salads. 4- Take the sun-dried tomatoes, drain them from the oil in excess and mince them with a knife. The divide and sprinkle them into the 2 salads. Lariano or Genzano. Look a this interesting blog I found – Italicious – with 20 breads of Italy. Have a good salad and Buon Appetito! It's difficult to translate Spaghetti allo Scoglio...Maybe Spaghetti on the Rock? Your Honor, I am innocent! The recipe was too good and I had to steal it: Zucchini Potato Pancakes! How could I resist?